The Kitimat CDC is a CARF accredited, non-profit organization that serves Kitimat and Kitamaat Village. We offer three streams of support services for families, children and adult services that support a fully inclusive and inviting environment. As a non-profit organization, The Kitimat Community Development Centre is run by a volunteer Board of Director’s who are parents, business owners, and members of the community. Members of the Board are elected in June of each year. The CDC is an accredited organization with the Commission on Accreditation of Rehabilitation Facilities, or CARF. 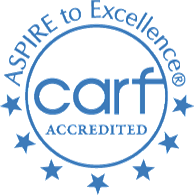 CARF is an independent non-profit accrediting body for health and human services internationally. Founded in 1966, this agency’s mission is to promote the quality, value, and optimal outcomes of services through a consultative accreditation process that centers on enhancing lives of the persons served. To maintain accreditation with CARF, agencies must meet consumer-focused standards by continually measuring and improving the quality of their programs and services. Our programs and services are measured across four outcome areas: access, efficiency, effectiveness, and satisfaction. An organization receiving a Three-Year Accreditation outcome has put itself through a rigorous peer review process and has demonstrated to a team of surveyors during an on-site visit that its programs and services are of the highest quality, measurable, and accountable. In 2016, the Kitimat Community Development Centre was again awarded three-year CARF accreditation! The following statements are our interpretation of the service philosophies, principles, and values that guide our service delivery decisions. No model or philosophy of service delivery stands alone and philosophies often overlap. All staff and clients of the centre are encouraged to share their individual understanding of our approaches to service delivery and to at any time raise thoughts or concerns that will assist in our goal of continual learning and improvements in our services. Input can be given using our suggestion forms or our concerns and complaints procedure. • Children, youth and families have the right to quality programs of intervention which facilitate physical, social, emotional, and intellectual development. • That each client is an individual with a personal, cultural, and family background, with unique strengths, talents, preferences, and needs. • Children and youth are uniquely dependent on their families for nurturing their growth and development. • In the importance of respecting that each family has its own structure, roles, values, beliefs, and coping styles and that each family is doing the best they can, and being the best they can be, at any given time. • Families should be provided with information in ways that allow them to make informed decisions that best meets their needs. • Ensuring that support and intervention strategies reflect a respect for the racial, ethnic, and cultural diversity of families. Program efforts will be built on family strengths and resources, rather than on correcting weaknesses and deficits. • Providing a collaborative, multi-disciplinary team effort that includes the client and support networks (both informal and formal) working in an atmosphere of equality and mutual respect. • Relationships characterized by honesty, respect, trust, reciprocity, and open communication. • Providing families with complete and unbiased information in ways that allow them to make informed decisions regarding their needs. • Offering parents as much choice as possible regarding their child’s program. Services may be delivered in a variety of locations including, in the home, school, community daycare or preschool, or here at the Centre. Scheduling efforts look to minimize disruption to the family and child’s routine. • Providing resources and supports in ways that are flexible, individualized, and responsive to the changing needs of individual clients and their families. The Centre as a non-profit organization holds our Annual General Meeting (AGM) as outlined by Section 60 of the Societies Act in June of each year. AGM dates are advertised a month in advance of the Annual Meeting. Membership in the Kitimat Community Development Centre Association is a yearly five (5) dollar fee. Membership shows support for the Centre and the services we provide in our community. You can obtain membership from any staff member, at the front office or at the AGM. At the AGM the election for our 10 members governing Board of Directors occurs. The Board of Directors nominates and elects the Executive Committee. The Board members include a balance of parents whose children receive or have received Centre services and members of the community. At the AGM a full Centre report is provided covering all programs and activities of the Centre for the last year. Board meetings are held monthly except during the summer months. Meetings are open to guests. The Board welcomes input and participation of those interested in the services we provide. The Policies and Procedures that guide the decision making of our Board of Directors is based on a complementary model of governance where staff and board work together, but each understands their roles and liabilities. As a non-profit organization, The Kitimat Child Development Centre is run by a volunteer Board of Director’s who are parents, business owners, and members of the community. Members of the Board are elected in June of each year. Membership in the Kitimat Child Development Centre Association is a yearly five (5) dollar fee. Membership shows support for the Centre and the services we provide in our community. You can obtain membership from any staff member, at the front office or at the AGM. At the AGM the election for our 10 members governing Board of Directors occurs. The Board of Directors nominates and elects the Executive Committee. The Board members include a balance of parents whose children receive or have received Centre services and members of the community. At the AGM a full Centre report is provided covering all programs and activities of the Centre for the last year. Board meetings are held monthly except during the summer months. Meetings are open to guests. The Board welcomes input and participation of those interested in the services we provide. The Policies and Procedures that guide the decision making of our Board of Directors is based on a complementary model of governance where staff and board work together, but each understands their roles and liabilities.